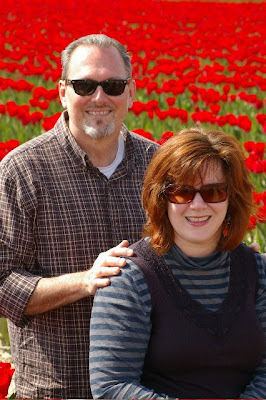 We spent yesterday with Marshall and Joan at the Skagit Valley Tulip Festival. We've been wanting to go since we moved here but just haven't had a chance until now. I'm glad we went for various reasons. 1) We had a great time. 2) We saw some beautiful scenery 3) We had a terrible week and this helped us take our minds off of losing Mickey. I'm so glad that Marshall drove because I would have lost my mind in the traffic. It was terrible. Once we got up there, we stopped at 2 tulip fields and Roozengaard. The fields were beautiful. Roozengaard was beautiful too but overcrowded. That's where all the tourists were. AHHHH! I hate crowds! After our flower-ful day, we grabbed dinner at Olive Garden in Everett. Between us, we took care of the bill with gift cards. Nice! After that, Sarah and I came home and crashed. I took a few pictures but the one of us was taken by Marshall. It's a keeper.